The emphasis of Horticulture Services is on use of The Institute of Living’s greenhouse, flower shop and grounds as a vocational training environment. Presently, individuals receive education and training in the maintenance, propagation, and marketing of plants in an effort to develop appropriate work-related behaviors and skills necessary to obtain and maintain community employment, enhance wellness, expand leisure outlets and promote recovery. 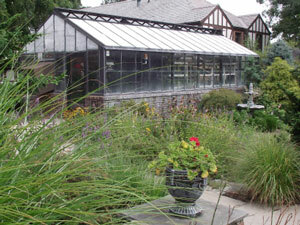 The greenhouse is a fully functional retail shop, which includes a small garden center and flower shop. Plants and arrangements are available for purchase year-round. It is a perfect compliment to the beautiful grounds and historic trees, and to the inherent benefits of horticulture. The Flower Shop is a popular component of the Horticulture Program and has been well received. Staff and trainees create an array of floral products for Hartford Hospital events and special occasions. G.R.O.W. originally started in 1995 as a horticulture vocational training program for at-risk youth from the Hartford school system. The G.R.O.W. Program is now a very innovative and demanding program, which helps teens develop the critical on-the-job skills and behavior necessary to find and obtain employment. It is a structured program, operating after school and weekdays during the summer vacation. Participants in the program provide "hands-on" interior plant maintenance, floral arranging and exterior landscaping services in the Hartford Hospital community. The ultimate goal of this training program is to have participants achieve meaningful and productive employment. G.R.O.W. relies on philanthropic support to help fund important program enhancements throughout the year. Gifts help us serve more teens, purchase needed supplies and equipment and continue providing sound vocational rehabilitation. The Horticulture Program accepts interested individuals for work skills training, student employees for the G.R.O.W. component, and volunteers for the greenhouse.